Extra Expansion for Easy Installation. Flexo Overexpanded has many uses where inexpensive bundling and management is the principal consideration. 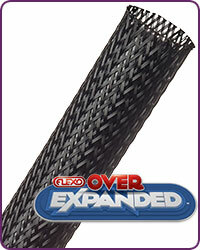 Created to provide a fast and easy solution for automotive and marine wiring, Overexpanded expands to nearly 4 times its nominal diameter, easing installation over large plugs and connectors. Flexo Pet Overexpanded available colors: black, neon blue, clear, purple, red, neon yellow, yellow.